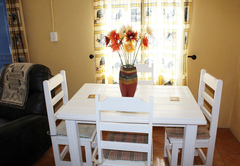 The Ark Sanctuary is a property providing self catering in Napier for up to 6 guests visiting the Cape Agulhas region. 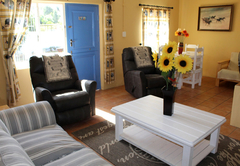 Situated on a smallholding in Napier, The Ark Sanctuary is a charming self catering cottage which can accommodate up to six people. Napier has an interesting history and is well worth a visit. 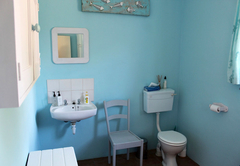 There are a number of excellent restaurants to visit after a walk around the town or a drive around the area. 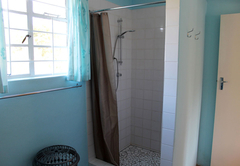 The cottage has two bedrooms and a large bathroom with a shower. 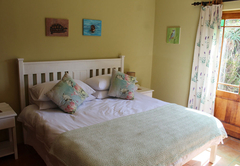 One bedroom is furnished with a King-size bed and opens onto the garden. 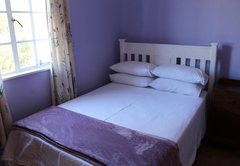 The second bedroom has a double bed. 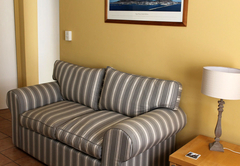 There is a sofa bed in the lounge for additional guests. 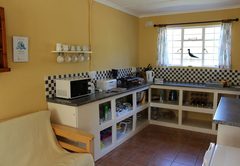 There is an open plan kitchen, dining area and comfortable lounge. 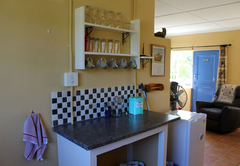 The kitchen is well equipped with a fridge, double gas ring, microwave, kettle and toaster. 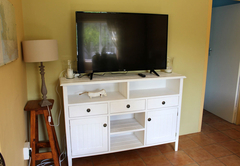 Wi-Fi is provided and there is a Smart TV (no DStv). 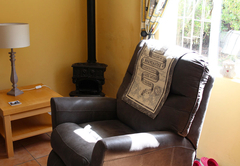 The cottage is equipped with a heater and air-conditioning. 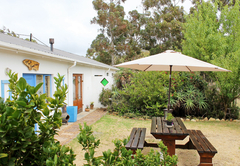 The cottage also has its own enclosed garden, a picnic area with braai facilities and a private parking space. A delicious breakfast can be provided if you would like it (extra cost), but it must be requested at least 24 hours in advance. 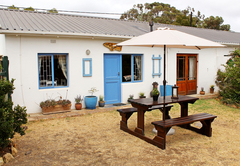 We can't accept pets as we have our own dogs and cats and free range chickens on the property. 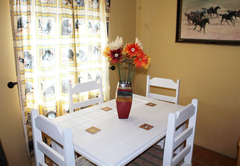 If you are lucky, we will find their eggs and you can have fresh eggs for breakfast. The bird life around Napier is prolific, so if you are a birder, please contact Steve for a bird list. 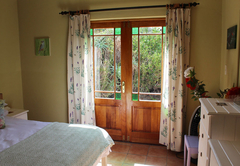 He will also be only too pleased to arrange a birding trip out to the wheat fields and the surroundings of Napier for you, or even just to chat about birds.